An effective marketing campaign involves staying on top of the trends. You need to reach your clients where they are, and there is no better way than on their cell phone. People don’t go anywhere without their phone these days, making SMS marketing highly effective. Many businesses are finding success on growing sales and retaining clients through the use of sending text messages to their target audience. One popular pizzeria found that they were easily staying busy on the weekends, but were slower during the week. They wanted to increase their sales during the week so they started a text message marketing campaign. They began by sending a text before lunch on Monday offering a free drink to anyone buying two slices of pizza. It worked! They experienced a higher level of traffic than on typical Mondays. Pep Boys, a popular automotive business, has used SMS marketing to retain customers by turning their negative experiences into positive ones. After implementing an SMS program they were able to reach out to customers that were providing negative reviews and turn over half of the experiences around for the client. They have used texting not only to grow their sales but to improve their customer service. Are you ready to see the same success with your business? SMS marketing campaigns are difficult for some businesses to wrap their heads around. However, there is a formula that will help you get it right every time. This periodic table will walk you through crafting an effective message to reach your customers. Your SMS marketing strategy needs to fit into the bigger marketing strategy of your business. If you are working to improve customer retention numbers, then your SMS strategy should take that into consideration. Or, if you want to build new customer relationships, the messages should line up with that. Before you begin constructing a message you need to have a goal in mind. The main goals for an SMS campaign could include growing your list of subscribers, increasing traffic to your site or business, increasing engagement with your followers, or finding new leads. Or, the goal of your campaign could simply be to increase your business sales. Once you have your goal established this should be the main focus of your message. Do not just start putting together a text without ensuring it is in line with your marketing objective. With your goal established it is time to choose the type of campaign you are going to run. The periodic table shows some of the most popular types of marketing campaigns to use for your business. Carefully choose which one to focus on to support your goal. For example, special occasion offers, holiday offers, and other time-dependent discounts and coupons will help to bring in sales for your business. And if you are looking to gain new subscribers a better type of message to choose would include promoting your loyalty program or a new product launch. Including the key elements is crucial to sending a successful SMS message. The rule of thumb is to provide your reader with something valuable, then clue them in on what has to be done, and close it up with a brisk call-to-action. The last two elements in this category are the most vital ones. The text should be relevant – for that you will have to do some customer research beforehand, and then customize the message accordingly. It should also create the urgency vibe to make the customer want to take the action right away. People don’t mind receiving sales messages, but they don’t want to be bombarded by them. The best practice is to limit the number of texts that you send to no more than 4-5 messages a month. Otherwise, your unsubscribe rates will start to grow rapidly. You also want to avoid sending messages during working hours or late at night. Choose to send them in the late afternoon or evening hours when people are likely to be able to read their messages immediately. The only way to know if your SMS marketing campaign performed well is to watch your metrics. The numbers you want to be following will depend on which type of campaign you are running. If your goal is to increase sales and you used your message to promote a special discounted rate you can see how successful your campaign was by checking on how many times the discount was used – the redemption rate. An effective campaign can only work if you are adding subscribers to your list. The best way to go about doing this will depend on the type of business that you run and who your target market is. However, if you are ready to start finding success through an SMS campaign then you will want to put the word out everywhere you can. Include verbiage notifying your customers of the option to receive discounts on the bottom of their receipt when they come to your location, blast a link to sign up around social media, and include the information on your business cards and any materials you have printed. Not every message is going to apply to every person on your list. Ensure that you are only sending texts that are relevant to your audience by breaking your list up into different segments. Consider dividing them based on sales history, loyalty programs, and geographic area. Or, if you have some products that only apply to an audience in a certain age range consider demographic segmentation as well. It’s as simple as that. 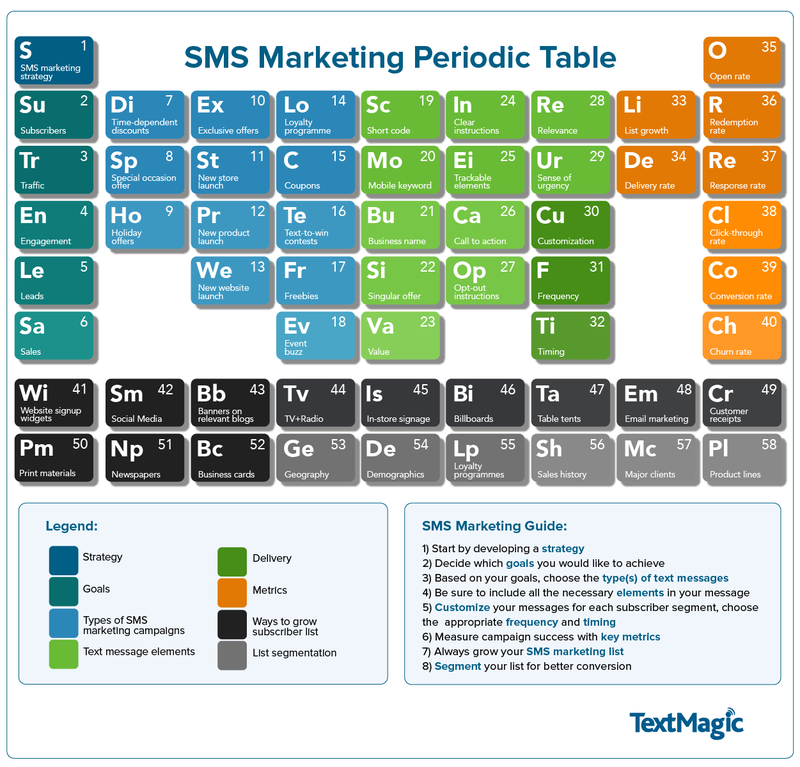 Pick and choose from each group of elements on the periodic table and you will be on your way to finding success with your SMS marketing campaign.